Electric, Gas, Or Propane Ice Auger? Which is Best? You are here: Home / Blog / Propane Ice Auger — Electric or Gas? Which is Best? Propane Ice Auger — Electric or Gas? Which is Best? propane, gas or electric? Which one is best for you? Should you buy a propane ice auger? Have you been contemplating buying a gas or electric ice auger? We compare ice auger types so you can decide which one is best for you. Meditation is suddenly being promoted as a miracle cure for everything under the sun, but as an ice fisherman you’ve already been doing it for years. When you’re chilling on the frozen lake or relaxing in your ice shanty you already know what it feels like to be in a calm state of mind. It’s one of those sports where you can relax more than ever, but as I’ve found out over the years there is stage of confusion you need to push through before the relaxation can begin and it has to do with the type of ice auger you use. Is a Propane Ice Auger for You? I don’t know which type of ice auger you use at the moment, but before the start of every season an ice fisherman always has doubts running through their mind as to whether or not they should upgrade to something better. Not only does each kind of ice auger keep improving every year, but you have to weigh up the pros and cons of each one. To help you come to a decision we’re going to focus on the individual qualities of electric, gas, and propane ice augers, plus we’ll touch on some benefits of manual hand augers at the end. HC40 is designed to take advantage of the higher octane rating of propane. Cutting through ice isn’t going to be silent no matter which type of ice auger you use. Although four-stroke gas-powered ice augers are becoming a lot more common they still make the most noise out of all the available options. Two-stroke ones are even worse, so if you’re cutting through thin ice and you don’t want to scare the fish away it would be better to go with a propane or battery-powered auger. Electric ones could be the best choice if you’re in a shanty as long as the ice isn’t too thick. While we’re on the topic of fishing in an ice shanty, it would be wise to highlight the dangers of using a gas auger indoors because of the fumes it gives off. Unless you want to choke, an electric or propane ice auger are once again the best choice. This also works in their favor because you need to keep both of them warm enough if they’re to operate efficiently, and if either of them get too cold they’ll stop working. Still, you should always have a way to keep them warm as an additional backup. Fully insulated with IQ Insulated Fabric for 35% more warmth. Now we’ll move onto an area where the gas auger excels, and the propane auger isn’t too bad either. If you need to cut deep holes into large chunks of ice you would be wise to use either of them. A gas auger takes the win in this category and should be used if it’s the most important thing you need it to do, but the propane ice auger has more benefits on average. Trying to cut through deep ice with an electric battery-powered machine isn’t going to work great in all conditions and it might take you forever to drill a hole. Electric ice augers are the least reliable of them all for two big reasons. Firstly, the battery won’t last forever and when it dies you won’t be able to drill any new holes. The power of the auger also slowly fades away as the battery drops making it harder to cut through the ice. Gas augers can sometimes decide not to work when you need them to, as you’ll know if you’ve owned a gas lawnmower, so even though they’re more reliable the propane gas auger wins this category. We’ve just destroyed the electric ice auger as far as reliability is concerned, but everything turns on its head when you begin to look at their portability. If you plan on moving around a lot or you don’t have something to carry a gas auger around they are the best of the pack. Even though they’re getting smaller with each passing year they’re also getting more powerful too. At the other end of the spectrum a gas auger is much heavier, whereas propane ice augers sit neatly in the middle although it’s very close. Anything with a battery isn’t going to last for years until something eventually goes wrong with it. There are too many moving parts in the electronics, but with gas and propane ice augers you only need to worry about the engine. Nothing will last forever and any auger will break if you don’t take care of it, but with the proper maintenance gas and propane ones will last the longest. Any gas-powered machine can last for years without malfunctioning, as you’ll see on many building sites. Don’t let your gear slow you down. This will also once again depend on the number of holes you plan on drilling and how deep you need to go into the ice, but you could already have your hole completed by using an electric auger before your propane or gas one has kicked into life. It will beat a gas auger in speed by a considerable difference, but if you need to drill down deep it will end up being overtaken. Things will get easier for the battery-powered one if you’re not fishing in the middle of winter when the ice is rock-solid. A battery-powered auger doesn’t need anything as long as you don’t plan on charging it while you’re out on the ice, although you might want to take an extra battery just in case. With the gas model you will need the gas, but you will also have to fiddle around with oil. It won’t need to be changed regularly, but it’s still something to keep an eye on. With a propane ice auger you only need to make sure you have your propane and there is nothing else to concern yourself with, so depending on how you look at it you could say it’s the winner of this category. There are many advantages to battery power. We already know hauling heavy ice augers can be made easier if you have the equipment to carry them around, but unless you have a little helper you’ll still need to fire them up. I don’t know how cold you get when you’re fishing on ice, but trying to start a gas-powered ice auger on a cold winter is enough to tire anyone out. It gets even worse if it doesn’t start straight away, so it’s officially the loser in this category unless you have the power of Hercules and physical exertion doesn’t bother you. If you fish in a larger hole it will be much easier for you, so you must take it into consideration when deciding what ice auger to choose. In reality you’ll pick up one between 6-10 inches in diameter, but even the difference between 6-inches and 10-inches is huge. Propane and gas ice augers will be able to handle the bigger diameters a lot easier, so by choosing an electric auger you might find it a little more difficult when you’re fishing. Well-constructed and engineered to last for many years. We’ve talked about some of the benefits you’ll get from each different ice auger, and the one you choose will depend on which one will suit you best. With that being said, we’re going to look in closer detail at one from each of the choices available to you in the hope it will make your decision easier. Propane provides the most power for ice augers. Available in 8-inch or 10-inch models. Lightweight, powerful high-compression 40cc 4-stroke engine. All metal, sealed ball-bearing transmission. Auto-prime fuel system for easy starting. Quick release bottle holder holds 1 lb. propane cylinder. 8″ or 10 inch diameter ice auger. Auto-Prime Fuel System : Flip the switch to ON and begin drilling. Even though this propane ice auger weighs a mere 30lbs, it’s extremely powerful and will cut through anything. It also comes in both an 8-inch and 10-inch model, and it will still drill through ice with ease using the larger model. Eskimo designed their auger to take advantage of the octane rating from the propane fuel, so it’s not the same as companies who convert their gasoline engines to run on a propane fuel source. The length of the auger is 42-inches long, so even if you’re in an ice shanty with a raised floor you’ll still be able to drill down deep into thick ice. Because the 4-cycle propane powered ice auger is clean burning it’s the top choice if you do fish in an ice shanty and you need something more powerful than its battery-powered cousin without too much extra weight. Eskimo deliver quality products all the time, so you can believe them when they say their engine was built from the ground up to last years. It’s made of 100% metal and the ball-bearings are sealed away to prevent them from coming loose. The bottle holder is also quick release, so as long as you have spare propane cans handy you can switch them over in a matter of seconds once they’ve run out. It won’t help you catch a fish but cuts through ice flawlessly. High performance 43cc Viper engine. Primer button for quick response starting. Quantum auger : Unique centering ring, and Quantum blades are extremely durable and hold their edge in dirty ice. Precision transmission offers optimum gearing: Only ice auger line using sealed ball bearings instead of bushings. Cold-weather tested engine has a high-profile ON/OFF toggle switch, and a muffler guard to protect you from hot areas. Mitten-grip recoil allows you to start the engine while keeping your hands warm, and a see-through gas tank allows you to easily track your fuel level. Wide-wing tubular steel handle bars. Foam handlebars absorb vibration, and a finger tip throttle trigger gives you precise power control. Available in 8″ and 10″ models. View or download the MANUAL for the Mako 43cc ice auger. This gas-powered ice auger is so powerful they had to put foam over the handlebars to make it easier for you to hold as you pound your way through the ice. It’s also easily operated using fingertip throttle control, so can be handled effectively when you’re wearing gloves. Just like the last Eskimo auger we talked about, this one also comes in an 8-inch or 10-inch model to help you drill wider holes should you want them. Solid construction means this auger will last a long time. 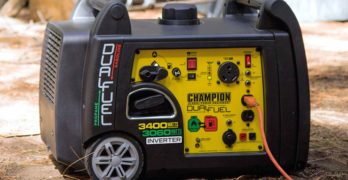 It has a primer button to help you power it up quicker, so even though it runs on gas you’ll be able to start it quicker than you would other models. It’s the same length as the propane model, but at 32lbs it’s a couple of pounds heavier. The Quantum blades Eskimo use have already been praised, but it’s worth noting they also hold up in dirty ice as you sometimes never know where you’ll end up fishing with a gas auger and no shanty. With any gas auger you have to be careful about where you place your hands if you don’t want them to get burned, but the Mako has a muffler guard in place to keep your fingers safe from the hot areas. One last point of interest is the see-through gas tank, which means you’ll know whether or not you need to throw in more gas before you attempt to drill any new holes. Has reverse to quickly flush the slush down the hole. Auger length is 34″ but can be extended to 46″ with the included 12-inch extension. Planetary gear transmission: all-metal transmission with planetary gears. Over-sized ergonomic trigger: easy to engage, even while wearing gloves or mitts, but protected by a dual trigger safety system and electric momentary quick stop brake. Aluminum handlebars and a compact, all-metal planetary gear transmission help make ion the lightest power auger on the market. It’s 40% lighter than a gas auger. Reverse gear: ion reverses direction, allowing you to quickly flush the slush down your hole. No more scooping means you’ll be fishing faster. Electric momentary quick stop brake. View the in-depth Brochure / Instructions for the Ion Ice Auger. The first thing you’ll notice about this electric model is the handlebars, which are by far and away the easiest to hold. They’re like what you’d find on a bicycle, so you’ll have no problem using the auger. The ability to hold onto it tightly is important because it’s got a powerful 40V battery capable of drilling through 1000 inches of ice before you need to recharge it. Even recharging the ice auger only takes a few hours. The auger itself is 34-inches long and capable of cutting through hard ice, and this is because it’s been manufactured with durable steel blades that won’t snap. The Ion auger has its own patented cutting system with trademarked Straight-Through blades and a Spot-On center ring to help make the drilling process easier. No more worrying about anything jamming up as you attempt to break through the ice. Ultra quiet thanks to the clean battery power. You will appreciate the reverse button on this particular 8-inch model, as it will help you clear slush out from your hole. You just need to dip the auger into the hole until it’s sitting below the ice and after pressing the reverse button for 20 seconds your hole will be flushed clean. Don’t worry about operating any of the buttons with gloves on as they’re all in perfectly-placed positions. If we’re being completely honest, you’re either going to use an electric, gas, or propane ice auger if you’re a keen ice fisherman. Even though each one has its positives and negatives, nothing will ever be able to come close to them except in special circumstances. A manual hand auger might suit someone who doesn’t fish regularly and can fish in areas where the ice isn’t too thick, but they are still the most popular auger for a reason. Traditional but effective. Download the manual. Every ice fisherman should carry one with them as a backup no matter what they currently use. They aren’t expensive, and with less moving parts they will never break down, especially considering you’ll only use it if your main ice auger fails. I wouldn’t write them off straight away, but if you’re looking for a main auger I’d weigh up the pros and cons we’ve talked about today and choose your next one based on what suits you best.